I am honored and humbled to receive this year’s Tsukahara Award. Dr. Nakaakira Tsukahara was among the first scientists to study memory by connecting synaptic, circuit and behavioral plasticity. My own research career follows the path pioneered he and his peers, combining conditional genetics in the mouse, behavioral assays, and the well characterized in vivo physiology of the hippocampus to try to understand the mechanisms of memory. The hippocampus is one of the most well characterized regions of the mammalian brain. 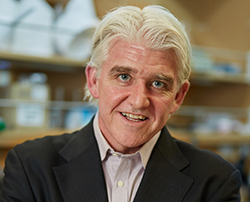 The discovery of ‘place cells’ by John O’Keefe nearly 50 years ago has led to a deep understanding of how cognitive representations are formed, used and modified in freely behaving animals. I was fortunate to begin my PhD at a time and place that allowed me the unique opportunity to work with Dr. Susumu Tonegawa and Dr. Matt Wilson to combine place cell recordings and mouse genetics for the first time. Throughout my career I have continued to exploit our understanding of place cell activity to probe how genetic interventions can alter spatial coding and information flow and give us insight to the memory functions of the circuit. A consistent arc in my research over the last two decades has been understanding the contributions of the distinct subfields to the function of the hippocampus. Characterizing the impact of the loss of NMDA plasticity in CA1 and the DG on behavior and physiology were the main focus of my graduate and postdoctoral work respectively. In my own lab we have continued to pursue these questions, examining how plasticity and transmission in all 4 regions of the circuit (CA1/CA2/CA3/DG) shapes memory and function, including recent work on the long overlooked CA2 region. While this work has been rewarding, it has also made clear that while information flow in the hippocampus is often described as progressing from the entorhinal cortex (EC) to the dentate gyrus (DG), then sequentially along the CA3/CA2/CA1 axis, the data suggest a more complex regulation of multiple parallel circuits. Understanding how these circuits are recruited and modified by task and cognitive demands is an ongoing challenge we aim to help tackle. In parallel to these subregion specific manipulation, my group has pursued projects employing physiology as a means to better understand memory dysfunction linked to disease. We have used mouse models of Down Syndrome and intellectual disability/autism, as well as external interventions such as seizure induction and chronic stress, to address physiological phenotypes connected to changes in memory. While each model is unique, one clear pattern emerging from both our work and others in the field is that these disorders are often associated with a dysregulation of the inhibitory/excitatory balance in the hippocampus. Better understanding of these dynamics in both the healthy and unhealthy brain will be invaluable in translating these observations into novel approaches to treatment. Most recently we have combined our expertise in physiology with transgenic memory ‘engram’ labeling approaches to better understand the links between place cells and memory. We observed a physiological signature of these memory neurons and a distinction between precise spatial coding and contextual indexing by distinct hippocampal ensembles, suggesting the hippocampal engram serves as an index of memory content. Future work must build on these results to address the precision of temporal coordination of the hippocampal regions in terms of specific memory-related ensembles. Overall the lab is committed to understanding how the dynamic routing of information in the local circuits of the hippocampus and across the brain underlies memory encoding, consolidation and recall. In the coming years we will remain focused on the use of current and emerging technologies to manipulate neurons and decipher their activity and on our commitment to pursuing innovative collaborations, both locally and globally. Despite decades of study, as we unravel the mechanistic roles of the hippocampus in learning, memory and disease we still encounter surprises and I look forward to tackling those challenges with my colleagues. Finally, I am indebted to the training I received from Drs. Tonegawa and Wilson and their lab members and to the ideas, effort and support of the incredible staff, technicians, students and post-docs that I have worked with at RIKEN. I have had the blessing of fantastic colleagues and collaborators and my success is a reflection of their contributions. Studying the mouse hippocampus. a. Coronal section of the mouse hippocampus with the CA2 subfield highlighted in green and the dentate gyrus in red. b. 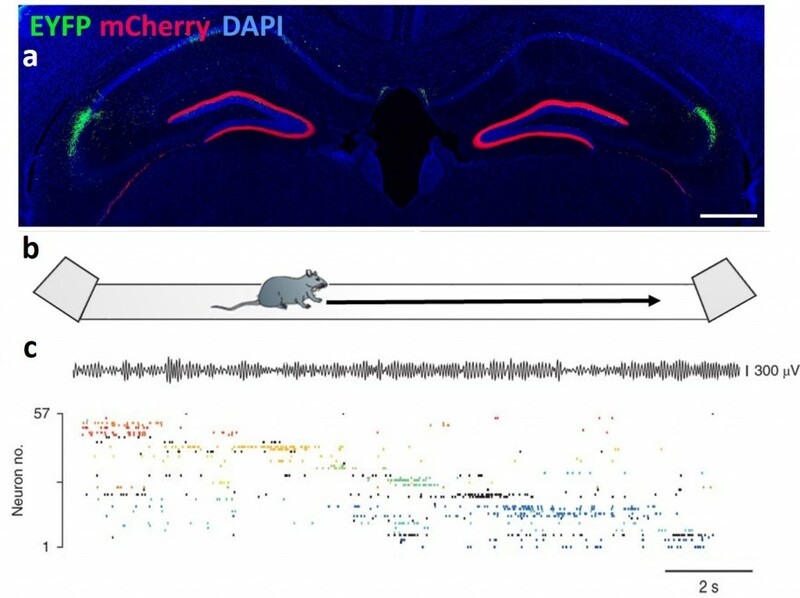 The activity of a large number of hippocampal neurons can be monitored as a mouse explores a track. c. An ensemble of simultaneously recorded CA1 pyramidal cells show temporally and spatially organized firing as the mouse explores the environment.